Click above to download the leaflet that was distributed at the April 4 event. On Tuesday, Occupy Denver was approached by RTD’s Union, Amalgamated Transit Union, to support the following action, which the General Assembly endorsed. This is an opportunity for us to talk with transit workers about May Day, as well as show solidarity by helping with ATU’s leafleting. Join ATU 1001 activists on your day off or split. 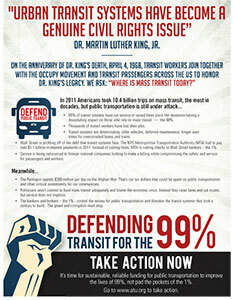 We will be leafleting transit riders for support from the 99% who need transit. Acknowledging their mutual concern about the crisis in mass transit, the General Executive Board of the Amalgamated Transit Union (ATU) has endorsed the National Day of Action for Public Transportation called by Occupy Boston to take place, April 4. This was written by Denver General Strike Committee. Posted on Thursday, March 29, 2012, at 2:17 PM. Filed under Events. Bookmark the permalink. Follow comments here with the RSS feed. Both comments and trackbacks are currently closed.